shot by the cop. Both the cop and Starr are shocked. The riots and protests that occur when the white cop goes free is what propels the film’s story. This is a story right out of today’s headlines – cops’s misuse of authority; minorities targeted; cops acquitted, riots etc. etc. Angie Thomas’ novel makes the story personal and does its best to have the readers and the audience identify with the protagonist. Starr Carter (Stenberg) lives two lives. In her working-class neighbourhood, she is Starr Version One, at home among family and friends, just being her teenage Black girl self. At school she is Version Two, code-switching her speech and behaviour to fit in with the rich, white world of her classmates. 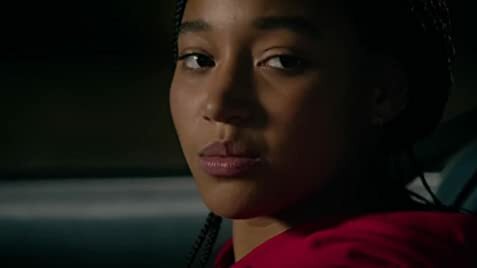 One night back in the neighbourhood she reconnects with her childhood sweetheart, Khalil who is shot dead with her as the key witness. There are only two witnesses: the police officer and Starr. Caught between worlds at a time when she is still working out who she is, Starr struggles to make the right choices. Should she testify or keep the code of silence demanded by the neighbourhood drug lord (Anthony Mackie)? Should she listen to her uncle Carlos (Common), a police officer who urges her to trust the justice system? And what can she say to her friends at school? These questions are dealt with to some detail which makes the film interesting. Chris, Starr’s new boyfriend is too kind and obliging for credibility. Director Tillman is also quick to manipulate his film for the purpose of crowd pleasing. When Starr video records the rough house attics the cops pull on her father, the film is quick to have her utter the words “I have to right to record this.” These lines got loud cheers from the audience at the screening I attended. There are two other similar segments in the movie that got the audience applauding. The ways the cops mistreat the blacks are also too well geared to anger the back folk. The white characters are mostly easy targets for a angry black audience which makes the film seem even more manipulative. But Starr’s charter is at lest to shown to be perfect. Her character is allowed to get angry and hurl a rock at the cops during an angry protest scene. Stenberg displays sufficient range of emotions to serve her character. Anthony Mackie is almost too good-looking to portray the bad guy drug King-pin. Common’s cop is well written character that offers a cop’s point of view. 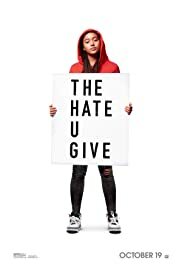 THE HATE U GIVE ends up a well orchestrated film, the only flaws being it being too manipulative, predictable and a crowd pleaser. This film contains as a result no surprises and no new insight.